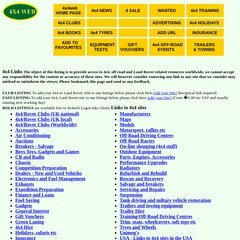 4x4links.co.uk 4x4 Web - Land Rover, AWD, SUV, 4x4 & Off Road links page. Heart Internet Network England is the location of the Apache/2 server. 4x4links.co.uk's IP address is 79.170.40.41. Its 2 nameservers are ns2.mainnameserver.com, and ns.mainnameserver.com. PING www. (79.170.40.41) 56(84) bytes of data.